Ever since my buddy, Jorge Espinoza of animebeers.com, and I have been beer trading, I have received some excellent stuff from breweries that are normally not found in Texas. This is my first encounter with Cismontane Brewing Company from California. These guys have an impressive looking core beer line-up, as well as their limited/seasonal/one off brews, and collaborations. I wanted this beer as soon as I saw this one online. The label did not pop out to me, but the fact that this is a Saison, which is one of my favorite style of beer, that was aged in Chardonnay barrels for 12 months really caught my attention. I had to get this beer. As I said earlier, the label for this beer is nothing remarkable, but it gets your attention with the large words describing this amazing beer. 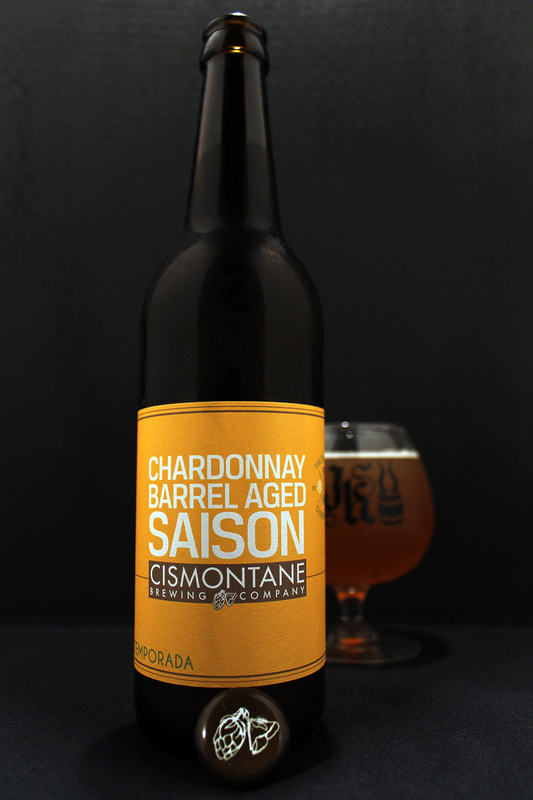 The base of the label is yellow, which works well for a Saison, The words Chardonnay Barrel Aged Saison is written in large white block letters, right above the Cismontane logo. The word Temporada is written in green at the bottom the label. A small cross section with symbols representing each season is located next to the large white words. I assume that Cismontane believes that this beer will speak for itself, so there was no need to fancy up the label. I poured this beer in a Jester King snifter glass. This beer’s appearance was a hazy bright golden orange color that was topped with a small 1/4 of an inch white foamy head. The head stuck around for quite some time as a thin layer atop the beer, leaving small spots of lacing on the glass. The aroma of this beer hits the nose right up front with a big wood barrel smell. There is a great mixture of chardonnay wine, hay, farmhouse funk, banana, pear, green apple, clove, vanilla, and anise. This has a great blend of fruit and spices thrown in a chardonnay wine barrel. The taste follows the nose just in a different order. My palate is met with a great mixture of fruit including flavors of banana, pear, and green apple. Spices soon follow, like, clove, anise, and vanilla. Hay, and farmhouse funk lingers in the background. There is a layer of wine, and wood barrel flavors that shadow over all the other flavors. There is a lingering aftertaste of wine, wood barrel, and banana. The body is medium with a slick mouthfeel, and a dry finish. Moderate carbonation with a bit of a bite. Overall, I was very impressed with this beer, giving this the highest 5/5 rating. It delivered on its promise in the overall flavor of the beer. The aroma and taste had all the right characters, fruit, spices, wine, wood barrel. This beer had a perfect blend. I am very glad to have tried this monster of a beer. I know I have seen this beer online at The Wine and Cheese Place and CraftBeerKings.com, along with other some of their other beers. Check it out if you get the chance. Metal Connection: As the name of this beer is Temporada, which is Spanish for the word seasons, I could have taken this Metal Connection many places. I went to the Chicago based Death Metal band, Oppressor. These guys played a technical style of Death Metal, complete with over the top fast riffs, insane drumming, and some jazzy sounding parts, rounded out by some deep menacing Death growls. In 1994, Oppressor released their debut full length album, Solstice of Oppression on the now defunct record label, Red Light Records. The opening track is the song chosen here, which is titled, “Seasons.” This was a killer opening track to this album, and by far, in my opinion, the best song the band ever released. Oppressor released 2 more full length albums in their career, Agony in 1996, and Elements of Corrosion in 1998. Both albums did not live up to their debut release, and you can hear a change in their style over the years. Agony had some good songs but nothing like the songs on Solstice of Oppression. One little known fact about Oppressor that some of you may know is that towards the end of their career, right before releasing their last album, Elements of Corrosion, bassist/vocalist, Tim King, guitarist, Adam Zadel, and drummer, Tom Schofield, along with ex-Broken Hope member, Shaun Glass, they formed the Alternative Rock/Nu Metal band, SOiL, which had some commercial success, especially with their song, Halo. That explains why their Death Metal career went sour. So let’s relive the best art of this band’s career, going back to 1994. This is Seasons.